Join Eric this week as he catches up with LT360 owner, author, and speaker, Coach Scott Oatsvall! Coach Scott has over 20 years of experience coaching and mentoring lives in all seasons. In this episode he discusses overcoming personal obesity and the night it almost took his life. He and Eric go deep into marriage and what it means to have real authentic relationships. They also chat about family and how growing up without a father changed his perception of parenthood. And finally, Eric finds out how Coach Scott and his wife Gwen came to not only adopt 4 children, but also begin a ministry to help other families do the same! We know you're going to love this episode as much as we did! 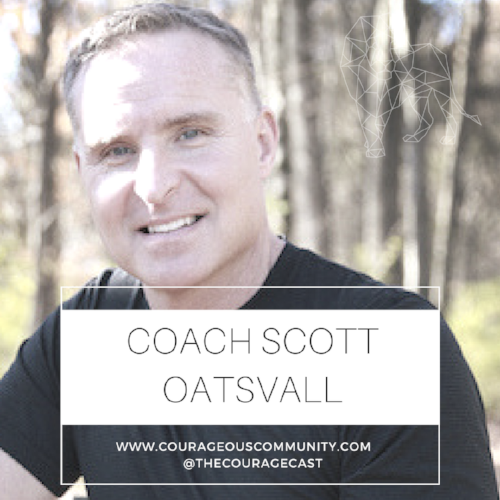 Remember to join us on Facebook at Courageous Community and share some of your personal take-aways from Coach Scott! We were so inspired by the Oatsvall's story of adoption! 147 Million Orphans is an amazing ministry that provides food, water, medical care, and shelter to orphans all over the world. Their mission is to spread awareness of the worldwide orphan crisis and share Jesus' heart along the way. We encourage you to check out their website and the video below for more information! "Need motivation, encouragement, or direction in your personal health journey? LT360 has done incredible things for me personally, plus thousands of others across the country. Check out this video from Coach Scott, and head over to the LT360 website for more information on his transformational company!" Feeling lost or uncertain in your current season of life? It's time to move forward and walk confidently into your future! Get started with a free download and video message from Eric!